"I've come from where I've come from in life the hard way, like most people. I was never one to spend any money that I hadn't earned, and I never envied what anyone else had." "What goes on today is over-the-top, and more Mike Todd than Mike Todd ever dreamed up. And I find it dysfunctional to a large degree, and what's dysfunctional is the public that supports it. [...] It's up to every woman and man to look in the mirror and know themselves. To know their social agenda, where they work — you know, dress for the occasion, and certainly dress within your means. Nothing is so important — to me, anyway — to go into debt to look a certain way." 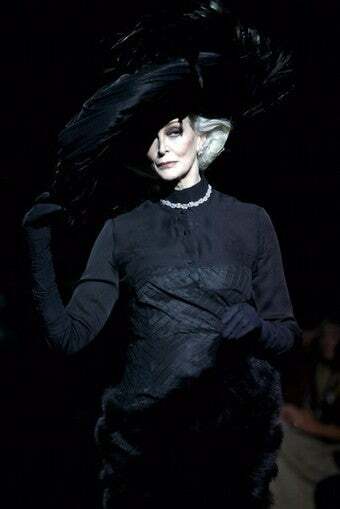 Carmen Dell'Orefice, who will turn 78 this June, started modeling at the age of 14, and earned her first Vogue cover after less than a year in the business. She's worked with great photographers from Richard Avedon, Cecil Beaton, and Irving Penn, to Mario Testino and Tim Walker. Just two weeks ago, she took a turn on the catwalk in London for the label Qasimi. For depth of fashion industry knowledge and experience, you can't go past Dell'Orefice, and this weekend, she talked to National Public Radio's Liane Hansen about her career and the future of fashion. Her comments about the economy might strike some as condescending — as a supermodel with a more than 60-year career behind her, including stints as a spokesmodel for Revlon and Clairol, and ongoing contracts as a face of brands like Rolex and Target, it'd be natural to assume that she probably has a different notion of hardship than the rest of us. In fact, Dell'Orefice was one of the many who recently lost money — in her case, her life savings — to Bernard Madoff's ponzi scheme. "I have to hand it to designers like Isaac Mizrahi, who reshaped and designed Target, and at a price range for not just the middle class but the poorer middle class. And he is a fine designer. [...] Everything should be affordable, because we're a country of such innovation. And some of the prices of things, it's irrational. You shouldn't be a fashion victim. Fashion is meant for every individual to describe their individuality, not to copy one another, but to inspire individuality."